Hello and welcome to my blog. Sunday is here again and that means it’s time for CASEing the Catty Blog Hop. 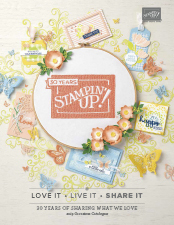 We are a group of demonstrators from Australia and New Zealand who love to take inspiration from our Stampin’ Up! catalogues. We CASE (copy and selectively edit) a layout, a colour palette or a whole card, the choice is yours. This week we are CASEing the Delightfully Detailed section, pages 38-51. You may have started with me or hopped over from Rebecca, make sure you click the next button at the bottom of my post to see all of the Crew’s creations. My starting point for this weeks CASE is the cute Rhino card on page 47 of the Annual Catalogue. I’ve used the embossed background, ribbon and circle elements for my card. Last week I held a Brusho card class. I think I’m slightly addicted to Brusho lol. We didn’t do this card in class but I demonstrated Brusho on an Embossing Folder then turned my demo into this card. I’ve used Moss Green and Prussian Blue Brusho with the Seaside Embossing Folder, how cool does that look??? I’ve used Swirly Birds for the little stamped boats using Night of Navy and Granny Apple Green ink. The boats are sitting on circles of Soft Sea Foam, vellum and 2018-2020 In Colour DSP with some Copper Trim behind them. The sentiment is from Oh So Eclectic. Next up tonight is Julia, you’re going to love her beautiful easel card. Just click on the next button to hop right over. Would you like to join us for the Weekly Challenge? Click below to send us a request to join then upload a picture of your CASE, it’s that easy. It’s Sunday night again and time for CASEing the Catty Blog Hop. You may be starting your journey here or you may have hopped over from Rebecca’s super cute project, either way, welcome. This week we are CASEing from the Animal Expedition Section, pages 26-37. I decided to CASE the cute “Rabbit in a Hat” card on page 36. I’ve used the tiny group of three flowers from the Beautiful Day stamp set to create my background. I’ve stamped the same image in Black, Pineapple Punch and Grey Granite. I then added a layer of Sahara Sand card stock, a strip of striped 2018-2020 In Colour DSP and a piece of water colour paper with a yellow Brusho background effect. I’ve coloured my cute little kitty with Stampin’ Blends then fussy cut him out. The little black piece the pot is sitting on was made using the Triple Banner Punch. The sentiment is from Cake Soiree and I’ve put a Champagne Foil Stitched Circle behind it. I’m really happy with how this card turned out, I hope you like it too. Next on tonight’s hop is Sandra, you’re going to love her creation. Why don’t you join in on our weekly Challenge? You don’t need to have a blog just upload a pic of your creation. We’d love to see it. Hello and welcome to another week at CASEing the Catty. Have you had a good look through your new Catalogue yet? I’m still seeing new things every time I look at it. And that’s the great thing about CASEing the Catty, it really makes you look at all the wonderful inspiration that Stampin’ Up! has given us. This week we are CASEing the Tea Room Section, pages 13-25. You may have hopped over from Julia, thanks for continuing on with me. The card I’ve used for my inspiration is on page 23. I have a couple of friends this card would be perfect for but I don’t have the Half Full stamp set. So I’ve used the design of this card to create something completely different. I have stamped the background from Birthday Backgrounds in versa mark then heat embossed it with White Embossing Powder. The banner is punched from Share What You Love DSP and I’ve layered it with some Berry Burst Metallic Edge Ribbon. I’m really loving the new Pearlized Doilies and if you’re going to layer sentiments over the top of them you can cut the middle out of them and use the centre on another project. I think the doily suits the round images of the background so I’ve used that instead of a tag like on the original card. I’ve added some Silver Glimmer Paper to the centre of some of the background images. 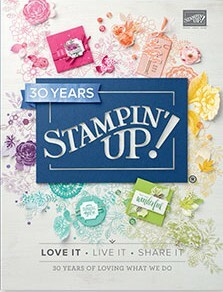 The sentiment is from the new Detailed With Love stamp set. Next on our hop tonight is the very talented Rachel. Click on the button below to see her beautiful project.